Product prices and availability are accurate as of 2019-04-13 22:37:49 UTC and are subject to change. Any price and availability information displayed on http://www.amazon.com/ at the time of purchase will apply to the purchase of this product. "Attentions: (1) This protective hat can't be used as professional safety helmet, so please use the professional safety helmet when riding on a bicycle, electric bike and motor bicycle, and playing outdoors. (2) The infants shall be taken care of by adults even with this protective hat. (3) It shall not be pressed by other goods and shall be kept away from heat source. (4) Our protective hat is soft and comfortable, but some infants still would not like to wear it. It doesn't need to worry about it, because they will get used to it after several times. Executive Standard: FZ/T82002-2006 Safety Standard: GB18401-2010 (Class A) Patented product and counterfeit will be sued; patentee: Suzhou Beilibao Baby Supplies Co, Ltd. A most recent investigation shows that: the nervous system and brains of infants are incomplete and relatively fragile, and their brain tissues are floating in the cranial cavity and not so fixed. Therefore, when their heads are colliding with something or being shaken or thrown fiercely, the brain tissues are likely to collide with the empty skull and result in brain damage. Though such damage will not show obvious symptoms in appearance, it may result in mental decline in adulthood. 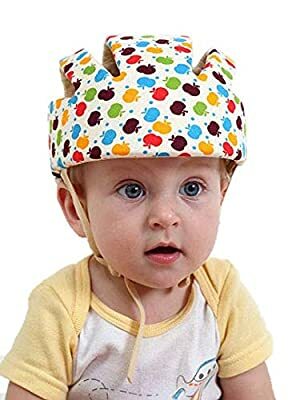 Therefore, it is very important for infants to wear "toddler helmets". " Main Function: with the function of damping and cushioning, this head protective hat can mitigate damage to the head from multiple hittings, bumps, bruises, and falling down when your active kids are learning to craw and walk; its strap is made of cotton and adjustable. Applicable Age: 8 months -6 years old. Baby Size: With head circumference of 16.9 inches to 22 inches. Weight: product is only 2.3 oz. Material: Facing: 100% Cotton; Lining: 100% Cotton; Filling?Multi-functional foaming material IXPE which is very soft, lightweight, with the advantages of shock absorption, impact resistance, good air permeability, non-toxic, odorless, antisepsis, environmental safety. Package comes with an instruction brochure. Attention: This protective hat can't be used as professional safety helmet, so please use the professional safety helmet when riding on a bicycle, electric bike and motor bicycle.